By Dr. Fiona Caldwell, a veterinarian and writer for Pets Best, a U.S. pet health insurance agency for dogs and cats. At first glance foxtails, referred to in some regions as cheat grass, seem innocent enough. But beyond that innocent exterior lurks a menace that can easily wreak havoc with your dog or cat’s health. Foxtails are simply fox-tail shaped clusters of seeds on the stalks of certain types of grasses. The clusters have sharp points designed by nature to penetrate the soil once the cluster comes loose from the plant, enabling the seeds to take hold in the ground and grow roots. Grasses with this feature can be found all around the country, but are most common in the Western United States. The greatest foxtail problem occurs in California. Foxtails are most troublesome to dog and cat owners in the late spring and summer in drier climates because this is when they come loose from the plant and “look for” a place to bury themselves. Dogs that come into contact with foxtails stand a good chance of having one of these insidious plant pieces work its way into the body, especially between toes. The result can be a very sick dog. The degree of illness depends on the area of the body where the foxtail entered and the amount of damage it has caused. Foxtails can enter the nasal passages, eyes, ears and mouth, and can work their way into the dog’s lungs, along the backbone and into many other locations throughout the body. Outside cats can be at risk as well, but less so since cats are such fastidious groomers and are adept at removing the grass awns before they penetrate and cause problems. The most common place foxtails cause problems in cats is eyes, most likely because this is one area they cannot groom. In the event that your pet comes into contact with a foxtail-infested area, be sure to examine their entire body, especially the undersides of the paws between the toes, the armpits, stomach and inside the ears. Signs that your dog may have a foxtail in his nose include sudden sneezing, pawing at his nose and possible bleeding from the nostril. As the foxtail works its way deeper into the sinuses, the dog’s reaction may eventually dissipate, leading you to believe whatever was bothering him has gone away. In reality, the foxtail has become even more dangerously embedded and may cause severe infection. 1. A foxtail lodged in your dog’s ear will cause him to paw at his ear, tilt his head, shake his head, cry and even possibly move in a stiff manner when he walks. You may not be able to see the foxtail since it may have become embedded deep within the ear. 2. Foxtails sometimes become lodged in the eyes, as mentioned above; this is the most susceptible area in cats. This will cause tearing, squinting, and mucous discharge and can present pink eye or conjunctivitis symptoms. The roughness of the foxtail can cause significant damage to the cornea in a short amount of time. Your pet may paw at their eye, but you may not be able to see the foxtail if it has lodged beneath their eyelid. 3. Your dog may even swallow a foxtail, causing him to gag, retch, cough, eat grass, stretch his neck and swallow repeatedly. 4. Foxtails caught between toes with usually look like a raised red blister or bump. They may or may not have discharge as well. Many dogs will lick excessively at the affected paw, or even limp. If you suspect your dog or cat has encountered a foxtail that has entered his body and shows any of these signs, be sure to take him to a vet immediately if you can’t remove the foxtail yourself. It’s important to act quickly. 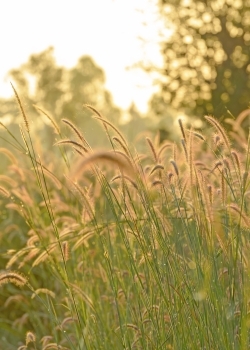 Foxtails can cause serious infections that may become fatal.